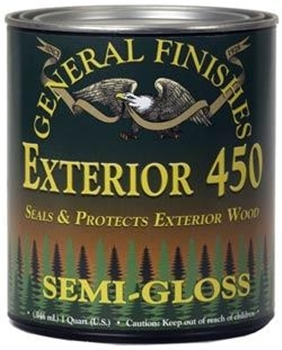 General Finishes Exterior 450 Clear is a high performance, exterior grade waterbased acrylic varnish designed to withstand full time outdoor exposure. Exterior 450 is fortified with UV absorbers to help minimize fading and maximize performance. Its built-in mildewcide retards mold and mildew growth. Exterior 450 is a tough and flexible finish that will tolerate the expansion and contraction of the wood through hot summers and cold winters that typically causes cracking and peeling. It can be brush applied and it also sprays and levels extremely well. This finish is well suited to exterior wood projects including garden or deck furniture, entry way doors, garage doors, pergolas and other natural wood surfaces. Excellent Moisture Resistance and UV Protection. Can be applied over water based or fully cured oil based exterior stains.